This entry was posted in Lung Cancer, Stigma and tagged addiction, forgiveness, Lung cancer, smoking, stigma. Bookmark the permalink. So true. The last thing a lung cancer patient needs is a dose of guilt about once smoking. As you’ve pointed out, lung cancer can strike anyone–regardless of whether they’ve smoked or not. Isn’t that a sad commentary on people …. A division within the cancer community. As if having any type of cancer isn’t bond enough. But it’s true. Great post. No one “deserves” to die from any form of cancer. Period. And those who don’t understand this, or who lack any kind of compassion for the ill, strictly from their life styles, are morally corrupt and soulless, and deserve not a whit of response or acknowledgement. I was a pre-teen when my older sister invited me to smoke a cigarette with her. I worshiped her, and was excited she included me. Smoking united us. By sixteen, I had a full-blown addiction that I couldn’t break. But the day before my dad’s birthday, when I was 35 years old, I smoked my last cigarette. For a decade, people celebrated this accomplishment with me. Relatives, friends and strangers asked me for tips to help them quit. More important, I forgave myself for poisoning my body for so long and committed to a healthy lifestyle. 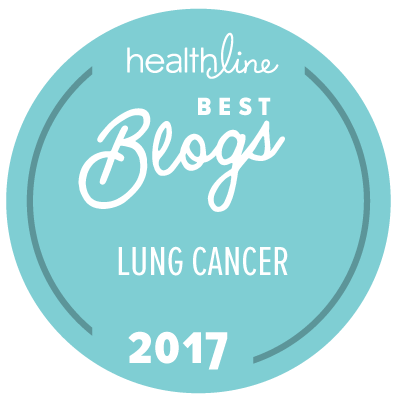 At age 46, I was diagnosed with lung cancer. Since that day, every time someone hears of my diagnosis for the first time, they ask “Did you smoke?” and, unlike my never-smoker brothers and sisters, I respond yes. Yes, but I quit a decade ago. Yes, but I know lots of people with lung cancer who never smoked. Yes, but I don’t deserve to die! I remind myself that the question usually is not intended to judge me, but rather the inquisitor is gauging their own risk. Smokers and ex-smokers usually follow-up with questions about my smoking history, perhaps hoping my history was worse than theirs. Never-smokers usually follow-up with questions about a loved-one’s smoking history, or about second-hand smoke. I patiently respond with the things I know, followed by “anyone with lungs can get lung cancer.” And in the end, many walk away still thinking that I deserve what I got, most without showing a bit of compassion. And I forgive myself once again, and tuck away the guilt and shame until the next round. It’s exhausting. It’s hard enough to fight the guilt and shame we put ourselves through after diagnosis, but to be reminded of it again and again by strangers, while we’re literally fighting for our lives is something most of us don’t have the will or the strength to tolerate. Which is why, when I look at my ever-expanding list of lung cancer friends who are active advocates like me, I don’t see many who have a smoking history. So you advocate for all of us. The rise in lung cancer among never-smokers has caused an explosion in lung cancer research (relatively speaking). We’re finally seeing this research extend the lives of lung cancer patients! And these patients are actively advocating for more research funding, better education, and better screening methods. As for this former-smoker, I will continue to fight lung cancer stigma by your side, and to do everything in my power to improve survival outcomes, no matter how exhausting it is. A lung cancer patient who smoked. K, thank you so much for your dedicated advocacy and for sharing your perspective so eloquently. May I quote you in future writings? Janet…I love you blog…I love what you do…open the eyes to those than cannot see. Thanks for this post! As a former smoker and a stage IV lung cancer survivor, I really appreciate the sentiments behind it. And agree 100%. Thank you.